The Nobel Peace Prize Committee’s chairman has been removed from his post for the first time in the award’s 114-year history. He’s been criticized over a number of the panel’s controversial picks, like US president and the EU. Ousted Chairman Thorbjoern Jagland, a former Norwegian Labor prime minister, had been in charge of the Nobel Peace Prize Committee for six years before he was voted out on Tuesday. He will remain a member of the committee, but the leading role has been passed on to the panel's deputy chairman, Kaci Kullmann Five, a former conservative party leader. Three out of six prize winners chosen under Thorbjoern Jagland have raised controversy. Jagland’s first year as chairman in 2009 saw the Nobel Peace Prize awarded to US President Barack Obama, who at that time had only been in office for nine months. Obama won the prize “for his extraordinary efforts to strengthen international diplomacy and cooperation between peoples," while the US was engaged in two lengthy wars in Iraq and Afghanistan, as well as heightened US drone strikes on suspected militants in Pakistan and Yemen. A Norwegian diplomat revealed in 2014, that the Obama administration itself was not happy with being given the award. "My colleague in Washington received a reprimand from Obama's chief of staff [Rahm Emanuel, at the time]. The word 'fawning' was used," Morten Wetland, who was Norway’s United Nations delegate from 2008 to 2012, wrote in an article published in the Norwegian daily Dagens Naeringsliv and cited by AFP. The Nobel Prize Committee’s 2012 choice of the European Union as the winner of the award has also raised quite a few eyebrows. Critics pointed out Jagland’s other role as head of the European Council as a potential conflict of interest. Many argued the prize was undeserved because of the EU’s economic and foreign policy failures. Archbishop Desmond Tutu of South Africa and two other Nobel Peace Prize-winners protested the decision in an open letter. A 2010 award to Chinese dissident Liu Xiaobo led to Beijing freezing diplomatic relations with Oslo. 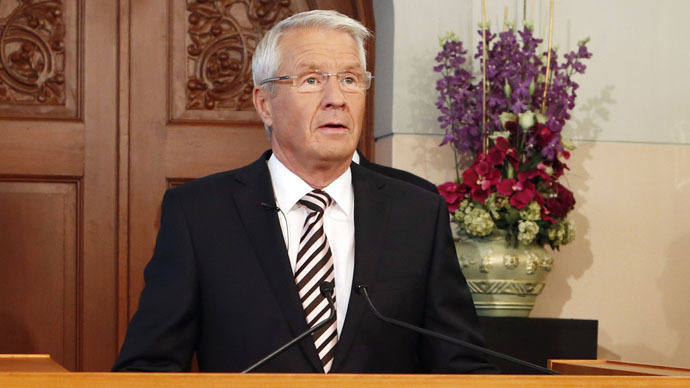 Jagland's removal has led to speculations over how much the prize is influenced by politics, having been replaced by another former party leader. Nobel Committee members are appointed by Norway’s parliament according to the power balance there. Right-wing parties won elections in 2013, which gave them a 3-2 majority over Labor on the Peace Prize panel. "This can be interpreted as an attempt by the rightist government to exert more political control over the committee than has been customary," Nobel historian Asle Sveen told AFP. There have been calls for the Nobel committee to be open to foreigners to boost its scope and preserve its independence from shifts in Norwegian politics.